Adding the chia seeds makes the jam thick and glossy. Jam is sweetened with maple syrup and little goes a long way in this recipe. It is super simple to make and needs about 20~25 minutes hands-on time. It stays fresh in the fridge for up to 2 weeks. In a small saucepan, combine blueberries, maple syrup, vanilla bean seeds and pod. Bring to a simmer, then reduce the heat to medium-low and simmer for 7~10 minutes or until the berries burst and the mixture is juicy. Remove from the heat. 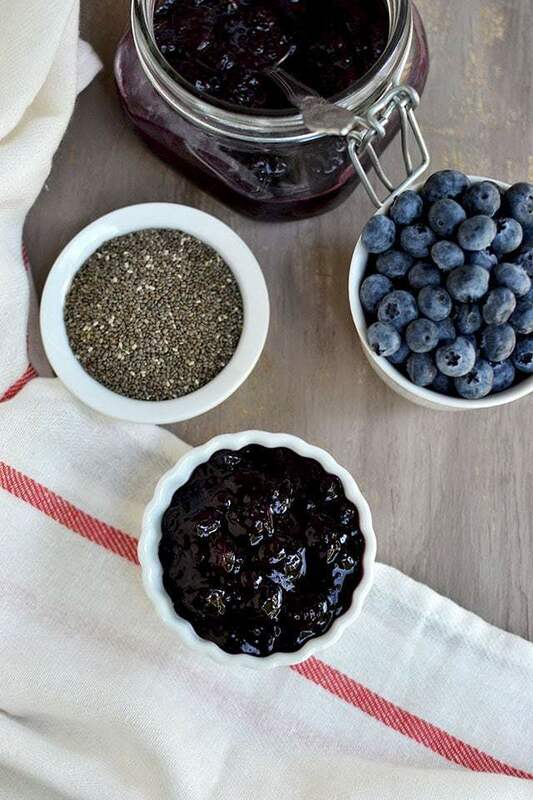 Stir in the chia seeds into the blueberry mixture, making sure to distribute the seeds evenly and not clump them together. Pour mixture into a wide mouthed jar or bowl. Stir the mixture once it has stopped steaming, you will notice that the jam starts to thicken by this time. Let the mixture cool completely. Taste and add more maple syrup, if desired and remove the vanilla bean. I added about 2~3tbsp more maple syrup.